Palabek Settlement, Lamwo — "I want to be an accountant when I grow up and menstruation will not stop me," says Gloria Kwero, 17, a grade seven pupil at World View Primary School in Palabek Refugee settlement. "Before the club was brought to our school, I used to miss one week of school every month until I ended my periods. "The club has helped me a lot because I got information about managing my menses. I also learnt how to make reusable sanitary pads and how to maintain them," she says. The start of menstruation is a natural and healthy part of a woman's life. But for many girls, that time of the month can be a nightmare to manage. The clubs have made a great difference in both school attendance and performance, said Stella Aloyo Oryang, the school's head teacher. 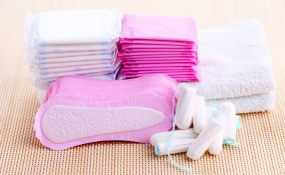 "Lack of sanitary pads was a major cause of school drop-out. Now we see a reduction in the number of girls leaving school. I see a lot of changes in our girls as far as performance is concerned," she says. "The clubs have created great self-awareness and girls are now opening up and expressing themselves. They are more confident," she says. "The clubs are very helpful. We are seeing better performance in class and no pregnancy cases have been reported in the school since the clubs started," she says. "Menstrual [dignity] kits are provided but girls should be empowered to make their own. We need to be able to reach every adolescent girl so as to keep them in school." "I stopped moving around at night as I realized this does not give me time to revise my [work]. When something is not good for you, you have to make the right decisions," he says. "In the club, I was also told I should not go for early marriage because it can lead to dropping out of school."